1.Will your mounts fit my TV? a.All our mounts are designed to universally fit all TVs regardless of make or model. However please pay special attention to models such as FSMLCD981s, FSMLCD981a, FSMLCD982a, FSMLCD901a, and LCD901. 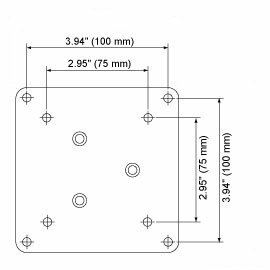 These models have fixed TV plates and require that your TVs to have mounting holes with VESA measurements as posted in each model. 3.How do I measure my TV’s VESA standard? 4.Where do you ship from and when will I get my order? a.All orders are typically shipped within 24 hours from our warehouse in California. Your order will arrive from 1-4 business days. We offer free shipping with each mount so the price you see is the price you pay. Currently we only ship via USPS priority mail. If you can’t receive mail from the post office, please contact us before placing the order. 5.How do I find the status of my order? 6.How do I know buying from you company is safe? a.We have been in the TV mount business for over 10 years. Mostly selling to installers and wholesaling to other resellers. We use a very reputable companies, PayPal and Authorize.net, to process all our payments. We never see your credit card or financial information as the the credit card service providers acts as a thrid party between you and us. Additionally, PayPal protects your purchase up to $2000 for 90 days. Also, only reputable companies are able to obtain an account with authorize.net after extensive credit history checks. 7.Why are your prices so low? a.We work directly with the manufacturer to bring the best mounts directly to the public. We cut out the middle man and pass on the savings to you. 8.With prices so low, are your mount of high quality? a.We NEVER sacrifice quality for prices. Our prices are so low because you are not paying high mark ups as it goes through multiple middlemen. We sell mounts to installers throughout the USA. They believe and trust the quality in our mounts and they put their reputation on the line.